Number 2: Japanese maples. There are way too many to not just put them all in one category. 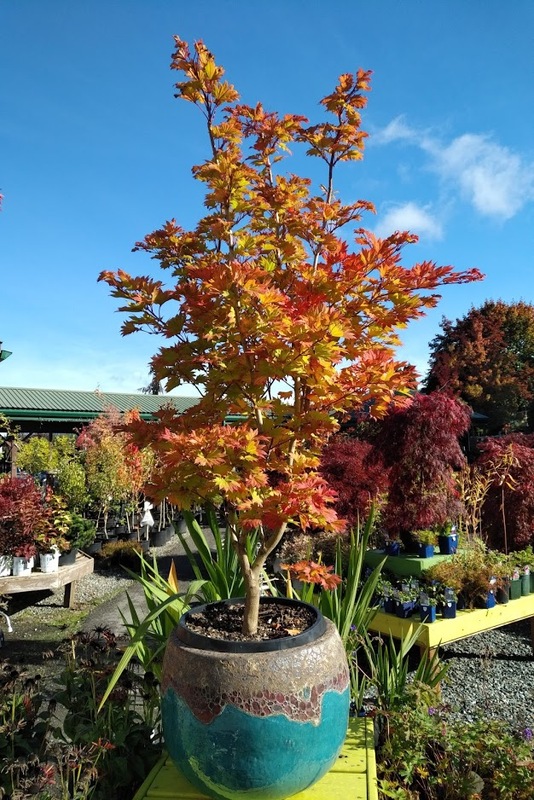 You could literally do a top 100 of just Japanese maples! So, I'll try my best to write about a few of my favourites that we still have in stock! The one pictured on top is Baby Buttons. The cutest little maple around! Its tiny leaves emerge bright green in spring with the scorching colours of Autumn following throughout the fall season. A dwarf selection growing about 2' every 10 years. Pictured on the left is the Golden Full Moon Maple. This is my all time favourite Japanese Maple! The leaves are cut so uniquely, it stands out in any garden! A very slow growing maple that prefers afternoon shade. The maple pictured on the right is White Peaches. This maple also prefers afternoon shade. Spring leaves are creamy white with pinkish tips. By summer they develop attractive green veins, but it's the fall colour that truly amazes!